Pirouette Cacahouète introduces "my Hot-Air Balloon" ! 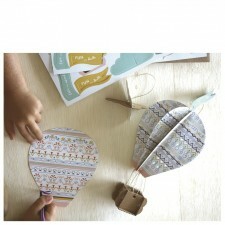 4 hot-air balloon and 4 clouds to be made and to suspend. The golden thread pulls together the four perforated paper pieces of the ball of the balloon, and the two cardboard pieces for the basket. 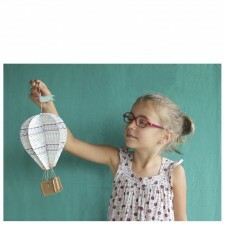 The balloon then takes shape and can be suspended. 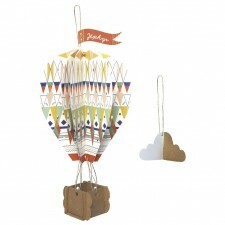 Cardboard and paper are also used to form a lovely cloud for hanging. 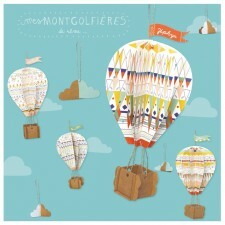 A poetic workshop where each can make its balloon and its cloud to suspend it then, and maybe create a decorative mobile ! Flying to the land of dreams…! 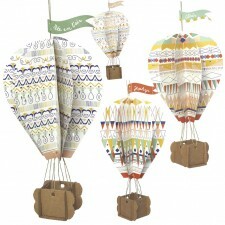 Ideal for hosting a creative activity at a birthday party or for decorating a wedding.